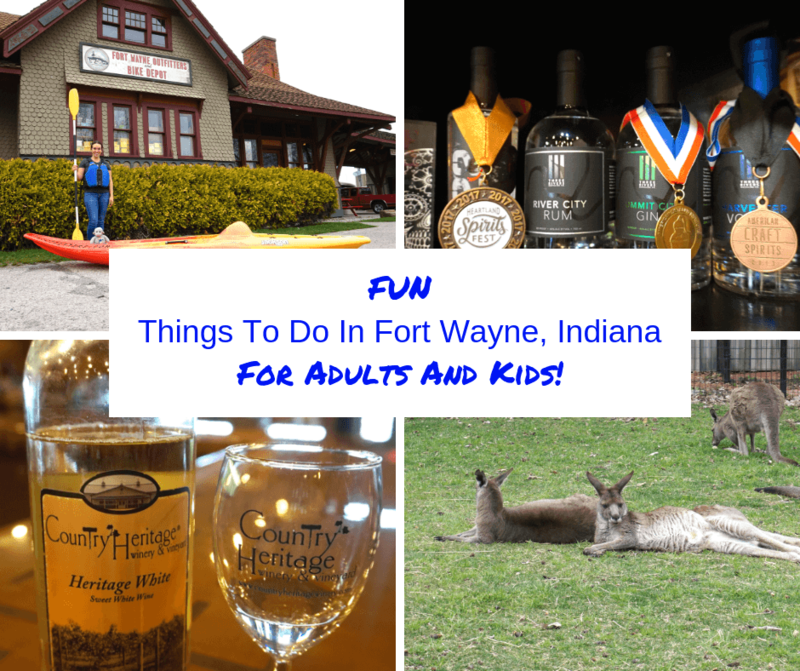 There are so many fun things to do in Fort Wayne – for adults and kids! See why you should visit this awesome city in Indiana! As we made our way across the US on our Midwest road trip, we stopped for a few days in Fort Wayne, Indiana. We know a few friends that had traveled to the city and all had told us great things about their experiences so we just had to visit and see it for ourselves. We found so many fun things to do in Fort Wayne! And the best part is that there is something for everyone, so no matter who you’re traveling with or for what occasion, you’ll find fun attractions in Fort Wayne. Whether you’re looking for romantic things to do in Fort Wayne or just want to make sure there’s something planned for everyone in the family during your trip, you’ll find great options in Fort Wayne. If you’re looking for things to do in Fort Wayne on a date, we recommend visiting Country Heritage Winery and doing a wine tasting. We also think visiting the winery would be fun if you’re on a girl’s weekend in Fort Wayne. The tasting room is open daily and they often have events like concerts and food/wine pairings. We chatted with the ladies that were serving wine that day and learned that the winery had opened in 2011 on the Lutter family farm. As we sipped on a few wines, we also learned that since opening, the winery has won multiple awards including Indiana Farm Winery of The Year two times in a row! The ambiance at Country Heritage Winery was certainly a relaxing one. We loved that they had multiple spaces to sit and enjoy your wine, our favorite of which was probably the outside wrap around porch. Oh, and we also loved that they used only local wood in their spaces. The decor throughout was beautiful and rustic. Country Heritage Winery is a great place to go for date night! Certainly one of the more fun things to do in Fort Wayne is to head over to Three Rivers Distilling Co. It is the only distillery in Fort Wayne and the first in northeast Indiana since prohibition. It is also veteran owned, which we really love. The Three Rivers Distilling Co. sources all of their grain from within 30 miles of the distillery and they do all of the bottling on site. Bruce, the owner, actually hand labels all of the bottles himself. Their restaurant also sources ingredients locally whenever possible. It’s a pretty impressive place, and we hear their Sunday Brunch is pretty awesome. We enjoyed our tour of the distillery and our tasting afterwards. Especially the tasting. We had a pre-prohibition style Old Fashion called “The Sphere of Influence.” What we really liked about it was that it was smoked. We’d never had a smoked cocktail before and enjoyed seeing how it was done. The Genealogy Center is definitely one of the Fort Wayne attractions that is more geared for adults. It’s an amazing place and probably the experience that surprised us the most during our trip. We ended up finding a ton of information about my mom’s side of the family that went all the way back to the 1700s! The Genealogy Center has the 2nd largest collection of family history in the US, and because it is in a public library, anyone can access the information. All together they have over a million physical items, including family history books, city directories, microfilm records, newspapers, and much more. Visitors can also do free online family research because the library has subscriptions to many genealogy websites. So websites like Ancestry.com that you normally have to pay for, you can use for free at the library. Additionally, the center holds classes regularly that teach visitors how to preserve documents, clothing, books, etc. And if you ever have questions or need help, the librarians are all genealogists, so they can answer any questions you may have. For art lovers, we recommend visiting the Fort Wayne Museum of Art. They have a large collection of of contemporary and historical art and they also have lectures, tours, and workshops. We suggest visiting their website to see what their upcoming events are and to see current exhibits, as they rotate every few months. There are plenty of things to do with kids in Fort Wayne, so if you’re traveling with kiddos, below are a few of our top recommendations. The Fort Wayne Children’s Zoo is one of the top attractions in Fort Wayne. It has over 100 animals across five exhibit areas which are very well laid out; it’s no wonder the zoo consistently receives accolades and awards! One of our favorite experiences at the zoo was being able to walk into the kangaroo enclosure! If you’d like to learn more about the Fort Wayne Children’s Zoo, we went more in-depth in this post. The kiddos will always remember that time they went kayaking in Fort Wayne. Or when they biked the trails along the river. So if your family is looking for outdoor Fort Wayne activities, head over to Fort Wayne Outfitters. They offer boat tours, rentals (bike, kayak, canoe, and SUP), and can even service your bike. They also have a shop where you can buy anything you need for your outdoor adventures in Fort Wayne. Fort Wayne Outfitters is the perfect stop for outdoor adventures! We think these Fort Wayne attractions are perfect for both kids and adults! Who doesn’t love chocolate, amiright?? Everyone will love a visit to DeBrand Fine Chocolates. Visitors can take a tour at their Auburn Road location on Tuesdays, Thursdays, and Saturdays. Each tour costs $5, lasts about 30 to 45 minutes, and at the end guests are given a coupon for $5 off a $10 or more purchase. Our tour was given by Chris who was very knowledgeable about the company and chocolate making. The tour starts with a seven minute video and then you go back and look into the chocolate making kitchens. Unfortunately, we weren’t allowed to take pictures while on the tour. Some of their chocolate even has gold! One of the most unique things to do in Fort Wayne is to spend some time at Sweetwater. This remarkable music instrument retailer started as a mobile recording studio and is now the number one online retailer and is number two overall in music sales, competing with others that have multiple physical stores. And Sweetwater only has one store! And there’s more to Sweetwater than just their music store. Their campus in Fort Wayne is like Disneyworld for music lovers. Yes, you can buy musical instruments. But you can also get private lessons, sell your used instruments, use their recording studio, get your instruments repaired, and even attend concerts! And the campus itself is gorgeous. It was completed in 2007 and is LEED Certified Platinum, meaning the building is energy and resource efficient. They use a lot of natural light, bamboo materials, recycle as much as they can. You can tour the campus like we did and see why this place is so awesome. Make sure you stop in the diner, which makes all of their food from scratch, and go down the slide. Yes, they have a slide! Sweetwater looks like a fun place to work! Touring the Sweetwater campus allows you to see how much they offer their customers! An oasis in the heart of downtown Fort Wayne Indiana, the Foellinger-Freimann Botanical Conservatory has got something for everyone! There are multiple indoor and outdoor gardens (gardens are accessible to wheelchairs and strollers) and there are often family events, concerts, and educational classes. The tropical garden was our favorite, with its waterfall, palm trees, and chocolate trees. The desert garden surprised us though because there were three giant Saguaro cacti, which we know had to be incredibly old. Many different gardens, including desert and tropical! Fort Wayne also has a lot of public art that we know everyone will enjoy being on the look out for. Make sure to check out this post to learn more about the many art pieces throughout the city. For your weekend getaway in Fort Wayne, we suggest the Holiday Inn Purdue – Fort Wayne. It’s in a great location; close to many Fort Wayne activities, attractions and also close to many restaurants. Our suite had a comfy bed, desk area, microwave and refrigerator, coffee maker, and free WiFi. Parking was also free, which we always appreciate. The hotel also has a heated indoor pool and whirlpool, fitness center, and an on-site restaurant called the Mastodon Grill which serves classic American cuisine. Pro Tip: Booking.com always has great deals on hotels. Check prices now for this hotel! Our room had a very comfy bed! We had a great time in Fort Wayne! There was a lot more to do than we thought, for both adults and kids! So whether you’re looking for weekend getaways in Indiana, or passing through on a Midwest road trip like we were, we highly recommend visiting Fort Wayne, Indiana. What a beautiful place Vicky. I knew little of Fort Wayne save it was a city in Indiana which churned out some really good basketball players over the years. What a fabulous post. I never would have considered Fort Wayne as a destination until I read this. Sounds like a great place! I had no idea there were so many things to do in Fort Wayne, Indiana. You know I love a good winery tour (it was so great meeting you and Buddy in FXL). I’d love to explore the art museum as well and I have a slight obsession with chocolate so I might just skip everything else and head straight to that incredible chocolate factory for the day! Wow, there sure is a lot to do in Fort Wayne! The Three Rivers Distilling Co. would be on top of my places to visit. Looks like they have a perfect patio to enjoy one of their award-winning spirits. I had to pop over to their site and take a look at their Sunday Brunch menu, it looks delish! I’d also love to visit the Genealogy Center and do some research about my own family history. How cool that it’s all available for free! Typically, our travels are centered around nature & outdoors, so we will definitely check out Fort Wayne Outfitters for a bike our kayak rental. Thanks for putting Fort Wayne on my travel radar, I won’t hesitate making it a stop on our itinerary when planning a road trip out West. To be honest, I’d visit Fort Wayne just for the Three Rivers Distillery – I LOVE an Old Fashioned, and The Sphere of Influence is such a great name for it! I enjoy small businesses like this, and having it be veteran-owned is fab. I’m so pleased you got to find out more about your Mom’s side of the family at the Genealogy Centre – family history is like a rabbit hole into time! Looks a lot to do in Fort Wayne for sure! Fun for the whole family. Wouldn’t be into the wine tasting, but the tour of DeBrand fine chocolates would be right up my street, and especially Sweetwater! Looks like a musicians dream! Out of all of your suggestions, I think I would like the Fort Wayne Museum of Art the best. And they even have a Chihuly! I am sure we would enjoy Sweetwater and the Botanical Conservancy too. We tried to visit Fort Wayne this year, but unfortunately the campground was filled to capacity. It looks like we will have to try to make it back sometime. We have gotten to walk in a kangaroo enclosure at another zoo and it thrilled the kids. I have never heard of Sweetwater, but now I really want to check it out! It is cool they have a slide you can go down. Yeah, it looks like we will have to head back to Indiana to check out Fort Wayne because it looks like a fun place. I never think of Indiana in general as a destination for a trip, but Fort Wayne looks like it has a lot to offer! I would love to visit the Botanical Conservatory. And I know I’d be stopping at Rebrand for some goodies! Wow! What a beautiful ambiance at Country Heritage! And, even though I don’t have any kids, I’m super tempted by the kangaroos in the petting zoo! There’s so much to do! Never thought of Fort Wayne before, seems like a good place to hangout.